“Go Set a Watchman” the suddenly discovered second novel of the saintly Harper Lee is disturbing, vile, truthful and a real American horror story. And you believe every single word of this Southern Gothic page turner. It’s very well written and it’s compelling. But it’s a novel that takes us inside the Ku Klux Klan in ways readers of “To Kill a Mockingbird” will find frankly disgusting. If only they hadn’t found it! But they did and now we all have to deal with the seething, horrifying racism that it seems American literary hero Atticus Finch. or should I say FORMER hero, for he is now forever dethroned seems to whole-heartedly condone. Yes, a meeting of the KKK is the centerpiece of this book, the way the courthouse trial was in “Mockingbird.” And yes, they both happen in the same “sagging” court room! Beloved characters from “Mockingbird” will never be quite so beloved anymore. “Watchman” destroys the innocence of all involved quite completely. And I feel Harper Lee meant this. REALLY meant every mean word in this shocking book. And I mean, MEAN! You’ve loved these characters. They are people to you, and to me. And so you feel quite astonished to find there’s more to them than you ever thought. Three-dimensional is what it is. It takes great writing to make you feel so deeply. And upset you so much, when they characters(people) you thought you knew are not behaving in ways you thought they would. It’s like being at some great family quarrel, that you wish you could get out of, but you can’t. They’re your familly now too,.You’ve invested so much time and thought and love into them, you’re stuck.. You’re gripped. Maycomb, Alabama is a hot-bed of racist issues and all kinds of human rights abuses and points of view that hopefully its’ real-life counterpart Munroeville has long ago out-grown. But here we’re smack dab in the middle of the 1950s, before the Civil Rights movement had really begun. But it WAS beginning and all the residents of Maycomb are scared out of their wits by it. Jean Louise Finch, the now grown up Scout of “Mockingbird”, is also questioning, tacitly, her own sexuality, at least as far as fitting into the whale-bone corset of Southern womanhood, which is the marriage that awaits her. Or does it? I wish she’d gone further with this train of thought, but she stops there.Suffice it to say, we are treated over and over again to Jean Louise’s absolute horror at having her first period, her dislike of dresses, her preference for slacks and her constant vomiting as she discovers that a) she is a woman and not a boy and b)that her beloved father, and also her fiance are card-carrying members of the KKK. Even her doting eccentric Uncle Dr. Jack turns out to be something else other than he appears to be. So we are treated to upchuck after upchuck and indeed this whole strong novel seems to be spewn, rather than written. The world, the South, her father, her aunt, her uncle everyone makes Jean Louise sick .And I felt a bit ill at the end of it, too. And angry. It’s a polemic of the first water. A rant. Against racism, and also against heterosexuality, which the author(it was written BEFORE “Mockingbird” in the closeted ’50s.) against injustice, against male chauvinism which she encounters on every page, all of which left me with a profound distaste of Maycomb, Alabama and all its’ inhabitants, fictional or otherwise. And this is the most difficult conclusion that Jean Louise Scout Finch has to come to, too. That she is inextricably part of it all. She was born that way and fight as she might against it all, and she DOES fight, she is stuck with this is who she is and what she has sprung from. One only hopes that her character gets back to sweet Manhattan asap. “Go Set a Watchman” is an important book, but it is a disturbing one, and it left me quite frankly, nauseated. But for all the right reasons. It’s soooo difficult to write about the tragic passing of Phillip Seymour Hoffman, because I looked so much like him & was mistaken for him almost constantly. Especially when he played Truman Capote and won an Oscar for it. Then didn’t acknowledge the real person whom he was portraying so memorably. I got very angry about that more than once, especially at the National Board of Review awards that year when he didn’t even mention Truman or that he was playing a gay character. Nothing. Zip. In that acceptance speech that night or when he went on to win every award in the world that year for “Capote” culminating in the Oscar.And it was the year of “Brokeback Mountain”, too. The Year of the Queer, if ever there was one. Contrast these acceptance speeches to what Jared Leto, who keeps winning and winning for “Dallas Buyer’s Club” has been criticized for, which is leaving out People with AIDS He’s corrected that. Phillip never did. He didn’t think it was appropriate, at that time. 2006 which seems like 100 years ago in gay life. Phillip saw the resemblance between us, too. I remember sitting in the front row of a press conference at the NYFF, can’t remember the name of the film, but he played yet ANOTHER gay part, this time a drag queen named Rusty. And he REALLY looked like me, when I lived in drag in the early ’70s. And he kept turning to look at me in the audience and was clearly disconcerted by the resemblance as I always was. 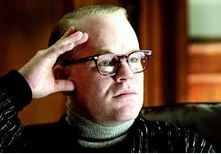 But for a straight man with a family and children, he played many, many gay parts both before and after Capote. He looked so much like me in some films especially “Boogie Nights” where he heartbreakingly played a young, long-haired P.A. who had a crush on Dirk Diggler. That part was an enactment of me in the ’70s, friends commented to me. It was unnerving. But of course I appreciated the intelligence and the power that went into that characterization. We came officially face-to-face in the interview for “When the Devil Knows You’re Dead” which I posted in the previous piece here on my blog. And he was as uneasy about the striking resemblance as I was. It was uncanny sometimes. He was a blond. I was a redhead. But my god, it was an unusual similarity. Too close for comfort, and as you can see in the interview, Phillip is strangely scratching himself throughout. It was weird. I met him many, many times at press events and junkets after this interview, and he always acknowledged me with respect. He played soooo many gay characters, and there I was the living embodiment of the roles he always claimed were “very difficult” for him. Esp. Capote. He was one of the greatest actors of our time, or any time. He made 50 movies. He was excellent in all of them. From the Tod Solendz film “Happiness” where he played a creepy telephone stalker that broke him open to a wider recognition. To his last final great role of Willy Loman on stage live in “Death of a Salesman.” It was a great privilege to have seen him onstage in that iconic role. He was clearly too young for it, but there was a desperation about a forty-something man playing someone who was supposed to be twenty years older. And at the end of his life. And as the title says, it was about “Death”. Willy Loman kills himself at the end of the play. It was oddly prescient like Phillip KNEW something. There was a tremendous rough, urgency to his performance. Like he had to do that part, and he had to do it NOW. Like he knew there was no time left. And it turned out, there wasn’t. He had played the part in High School, too, according to published reports. He was kind of obsessed with it. Willy Loman is certainly one of the great roles in one of the great plays of American Theater. And for the record, in all my encounters with him over the many years I was covering him as a critic and entertainment journalist, I never saw or even THOUGHT of anything drug related in reference to him. He won the Oscar the year of “Brokeback Mountain” when many said that Heath Ledger should’ve won it. And then Heath died in an equally tragic way in similar circumstances. I wonder if that bothered him. It bothered me. And then he went on to play even MORE gay roles…Guilt over “Brokeback” and Heath not winning? Who can say? But the point is he played them all brilliantly, and with a range that we have almost never seen in an American actor. His agent, whom I mention in the interview, Sarah Fargo “found” Phillip right as he was graduating from NYU UNDERgrad it should be noted. And not their illustrious Graduate Acting Program. And it was Sarah, who became one of his life-long friends, who jump- started his career by getting him seen and into roles and projects where someone who looked like him would normally not have been seen and seen so quickly. He was a character actor, not a leading man, and I think he always saw himself that way. Or in the indelible preppy monster/alcoholic Freddie that Matt Damon dispatches so abruptly in “The Talented Mr. Ripley”? Or the creepazoid/charismatic cult leader Lancaster Dodd in “The Master”? And now that I think back on it the role that he was only moderately effective in was perhaps the role that was closest to him in real life as events have shown,the alcoholic Jamie Tyrone, in the incredible revival of “Long Day’s Journey Into Night.” Starring Vanessa Redgrave as the tornado/virago of a drug-addicted mother who terrorized her hapless family, she blew on to the stage with hurricane force and pretty much stayed at that unbelievable level of performance throughout the plays three acts. She was like a demon unleashed and she frightened the wits out of her family and CHANGED THE BLOCKING every night, though not the lines, which I could hear with crystal-clear clarity even sitting in the rear of the orchestra. Phillip shrank from her as his character was supposed to. And she throttled the living daylights out of Robert Sean Leonard every night, but you never knew WHEN she was going to attack him. I saw it twice. I’ll never forget it. Phillip’s untimely death is such a shock and an incalculable loss to American film and American theater. Maybe leaving us soon so was his way of saying “I’m done now. I’ve nothing more to give. I’ve said what I had to say.” And now he’s gone. In the most lurid way possible. With a needle in his arm. That small detail will haunt all of us who knew him, and the many millions who knew him through his work. But to know him that way or any way was to love him. His great, hungry spirit will always be with us. Our hearts go out to his surviving family and friends. That he will be missed is an underestimate. I’ve always thought that whatever unfortunate production found itself mounted at the slightly out-of-the-way Cort Theater on Broadway EAST, a bit, on W.47th St. was always doomed to bomb. I’ve always thought of the Cort as a Flop House. b) that it wasn’t a musical, I knew I was in for a bumpy ride. Or rather a bump-less night. I don’t know how I stayed awake. got the slammin’,scuplted, muscular body and, er, talents, to make up for his lackluster acting skills. His co-star and leading lady Emilia Clarke, then also needlessly disrobed, and joined him in the bath and the bubbles. This was supposed to signify…well, whatever it was I didn’t care, by that point. And this production is so dreary, on every level, I don’t think it will still be running by the time I finish typing this sentence. Already adapted into a musical that never opened, starring Mary Tyler Moore no less in 1966, “Breakfast at Tiffany’s” is not a flop-proof classic. Light as air and paper-thin as a novella to start with, the legendary film version starring Audrey Hepburn iconically summed up the social strivings of an era. Hepburn as Holly Golightly was utterly divine and floated on gossamer wings through 1960s Manhattan. She epitomized the struggling, moon-struck yearner in everyone, who comes to New York City. She was the essence of romance. Of dreams striving to be fulfilled. Of someone, who you cared about if her heart was broken, and…well…She made film history. A generation identified with her. You never forgot her, and “Moon River”! “Moon River” was FROM THIS MOVIE! It won the Oscar for Best Song and Henry Mancini’s dreamy, charming, zany music won Best Score. Audrey Hepburn on that fire-escape strumming her guitar and breaking your heart with “Moon River.” Poignant, haunting, magnificent. And they have the nerve! The outright GAUL! to have Emilia Clarke attempt a NEW tune-less tune, also strumming a guitar, also on a fire-escape, that was so dirge-like it reminded me of a funeral march. I wanted to escape, the theater, but alas, it was just the first act, and there was much more suffering, dullness and bad acting to be endured for nearly two more narly hours! Emilia Clarke is a British TV star and I imagine quite photogenic in a close-up. She’s evidently wowed the world in “Game of Thrones” on HBO. (I’ve never seen it.) But whatever the camera reveals of her talents, the stage just emphasizes what she doesn’t have, which is any kind of presence whatsoever. Could she have been any worse? No class, no style, no ethereal social butterfly her Holly Golightly, her Holly was like the Maltese Falcon, a fake bird made of lead. The great costume designer Colleen Atwood is also defeated here. Her clothes for Holly at least TRIED to suggest an effervescence. But in fifty shades of grey, which was the predominant color of the dreary slide-projected set, she just faded into the background as some gawky girl tottering around in her mother’s high heels and finery. I was around New York in the ’60s, and believe me it was anything BUT grey! Warhol’s divine drag star Holly Golightly, 40 years ago, in “Trash” had that demented, delusions of grandeur diva thing going on ALL THE TIME. I kept thinking of the great story about her in real life, when she successfully emptied out the French Ambassador’s wife’s bank account. Then went back again A SECOND TIME and this time the impersonation landed her “in the hooskow” as she put it to me on the Christmas episode of my TV show in 1992. IOW, Ryker’s Island. I must re-run that show again soon. This is what this “Breakfast at Tiffany’s” was making me think of….And it also made me think of how much like Christopher Isherwood’s Sally Bowles, Capote’s Holly Golightly really was. Did Capote read Isherwood’s”I Am a Camera” of his Berlin stories, and just decide “Oh, I can do better than THAT?” But did he? And yes, I kept waiting for the band to strike up and the music to begin, but alas, it never did. The actors just “spoke” Oy vay. And of yes, George Wendt wandered around, in a miniscule part of a bartender, looking embarrassed, like he was looking for the exit. And the cat! Oh yes! The cat! The cat was great! I really believed she was a cat! And the cat scampered off looking for the exit, just like George Wendt was doing. And so was I. As soon as I possibly could.